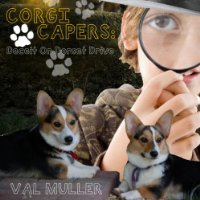 I’m pleased to announce that Corgi Capers: Deceit on Dorset Drive is now available in audio format. You can download your copy from Audible.com. I’ve downloaded several books from Audible–it’s a great deal when you purchase a membership, and if you sign up for a free trial, you can get several books free and then very inexpensively. I transfer my audio books to my mp3 player and listen during long car rides, runs, or even when mowing the lawn (I place my earbuds inside my ear protection). I’m also giving away discount codes for the audio book. Use the Rafflecopter form below to enter. The prize is one download code for Corgi Capers audio book. For every 100 entries, I will add a second download code (up to 5), so share with your friends. In the meantime, you can listen to a free preview of the book here. Posted on April 30, 2014, in corgi, corgi capers, giveaway and tagged audible, audio book, corgi, giveaway, kidlit. Bookmark the permalink. Leave a comment.